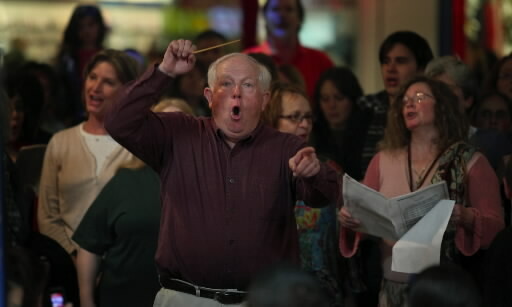 Popular local choral director Dan Earl might not be considered shy, but he certainly is retiring. Earl, now 71, retired in 2005 after 39 years of full-time teaching, 28 of them spent as a music teacher at Santa Rosa High School. And early next month, Earl will retire again, after 14 years as conductor of the Santa Rosa Symphonic Chorus, ending his tenure with his final four concerts with the ensemble. “Retire again? It’s not like this is something new for me,” Earl quipped. Indeed, he has been in and out of his various roles choral music in Sonoma County for more than three decades. Earl previously directed the symphonic chorus, then known as the Sonoma County Chorus, from 1979 to 1986. He also has been part of the Santa Rosa Symphony League’s annual “Sing-Along ‘Messiah’” concerts since they started 33 years ago, conducting all but one of those performances. “Dan is a very popular figure in this county,” said Evelyne Whitman, publicist for the Santa Rosa Symphonic Chorus. — 8 p.m. Friday (April 25) at St. Vincent’s Church, 35 Liberty St, Petaluma. — 8 p.m. Saturday (April 26) and 3 p.m. Sunday (April 27) at the Glaser Center, 547 Mendocino Ave., Santa Rosa. — 3 p.m. May 4 at the Jacuzzi Family Vineyards, 24724 Arnold Drive, Sonoma. The program is titled “Eternal Light” and features music of California composer Morten Lauridsen. Tickets cost $15 per person, and are available at santarosasymphonicchorus.com. At all four of the concerts, the chorus will be joined by the California Redwood Chorale, directed by Robert Hazelrigg, who will succeed Earl as the new director of the Santa Rosa Symphonic Chorus this fall. Earl said that, after more than 30 years of leading choirs, he decided earlier this year to step down, but he doesn’t rule out returning to the podium someday. “Who knows? Perhaps there is another choir in a few years that wants my gifts,” he said.